This excellent example of the Skoda Octavia SEL in race blue, has been very well looked after by its only owner and has full Skoda service history. 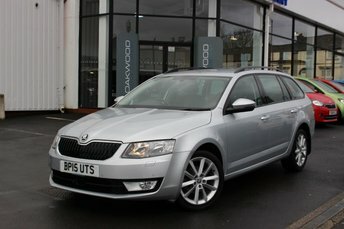 This fantastic example of the Skoda Octavia is fitted with Satellite Navigation with Traffic Reports, Leather/Alcantara upholstered seats, DAB Digital Radio, Bluetooth telephone and media use, dual zone Climate Control, Arm Rests and Drinks Holders for the front and rear, 360° Parking Sensors with an self park assist and Cruise Control with a speed limiter. Also featured on this Octavia are a multi function Steering Wheel, USB and AUX-in connectivity and a Central Locking system. This car has been well loved and regularly serviced. Available in a range of body styles and trim levels, the Skoda Octavia is designed for all-round family fun. The hatchback version benefits from a finely sculpted appearance and refined interior, while its spacious cabin and high spec interior ensure an enjoyable ride for all. You can come and take a closer look at the selection of used Skoda Octavia models for sale in Bury right now by paying a visit to Oakwood Motor Company Ltd in person. Alternatively, browse our vehicles here on the website ? just be sure to contact a member of the showroom team if you've any questions or would like to arrange a test drive.